I told a few folks that I was going to be making a diaper cake for my friend’s upcoming baby shower. 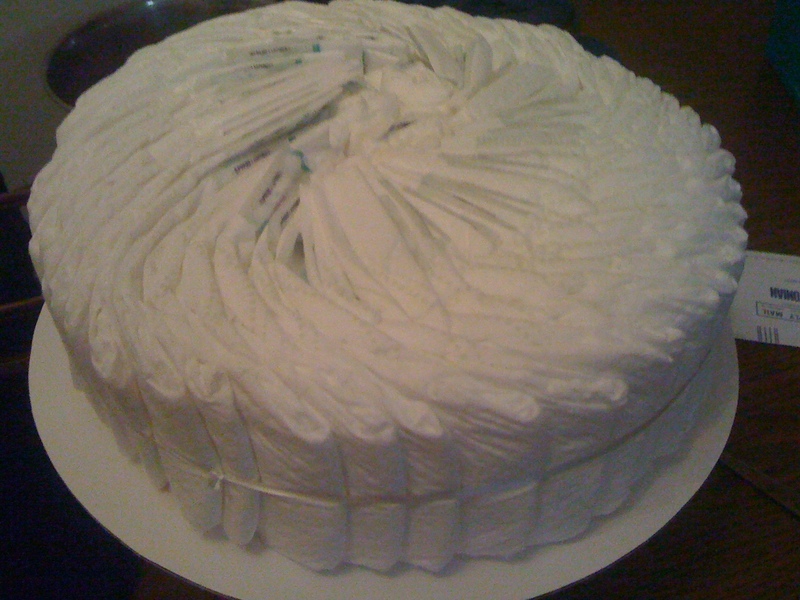 Evidently, the diaper cake phenomenon has not spread amongst my social circle because most people’s reactions indicated that they thought such a cake would be edible, not to mention incredibly unappetizing. 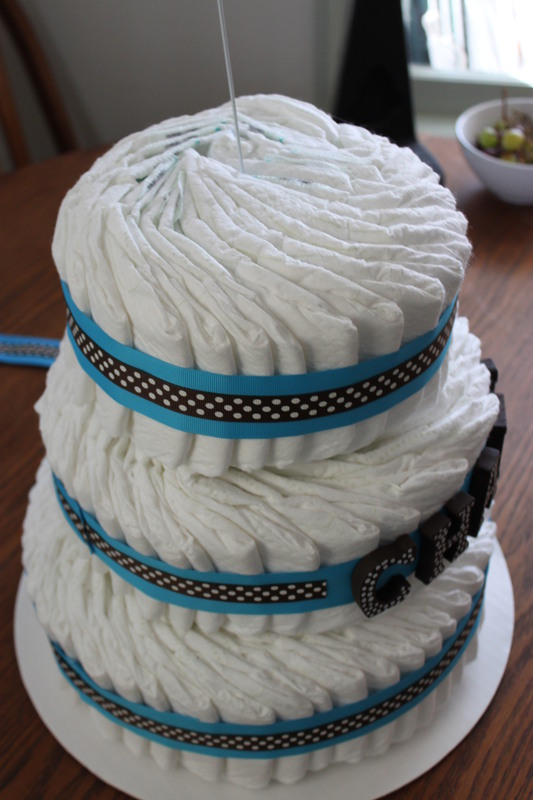 But now that they understand the concept, I think everyone agrees a diaper cake is the perfect baby shower accessory… and not all that difficult to put together! 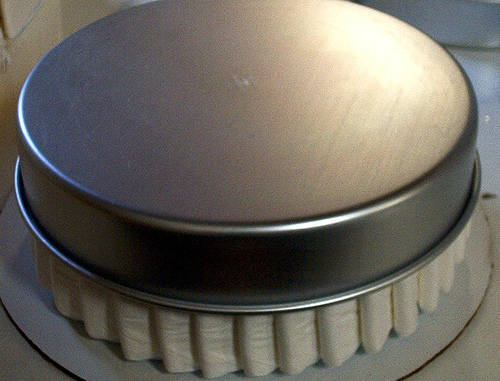 To make a 4 tier cake like mine, you’ll need 4 pans – a 12 inch, a 10 inch, an 8 inch, and a 6 inch. Continue filling with diapers until they are pushed firmly against the edges (meaning you can’t force any more diapers into the layer. Tie a ribbon (or use a rubber band) around the outside of the layer, and flip the pan over onto your base. Remove the pan (gently) and you have your first layer finished! 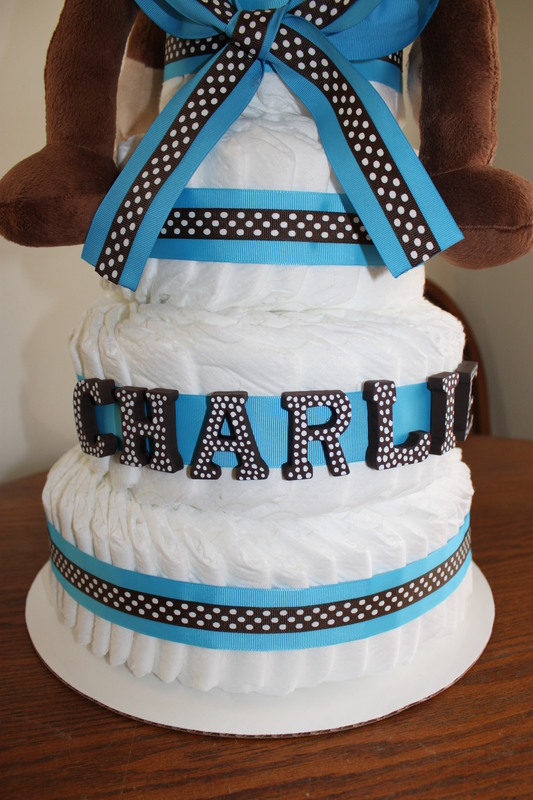 Repeat with all your remaining layers until you have a beautiful, plain white diaper cake. I kept the layers together with a plain white wire clothes hanger, bent straight. To use tape or glue would make the diapers unusable for the mommy-to-be. And then decorate however you like! 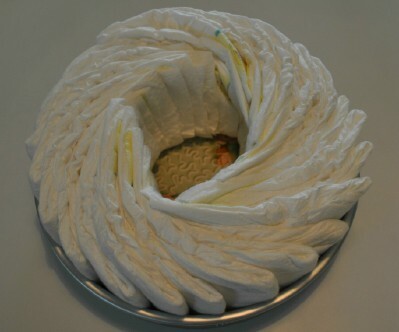 If you search the web, you’ll find tons of extremely decorated diaper cakes. Most of them are covered in baby toys and baby goodies, but I went pretty basic. Serve with cupcakes so you don’t disappoint those who are expecting an edible diaper cake! Jordan! Wow! I love your blog!!!!! Emily Coulter shared it with me and I can’t get enough. Its going to be my go-to for recipes now. How’s life? I’m in Chicago now, planning a wedding – lots of change! I look forward to keeping up with you (or at least your kitchen) via your blog. 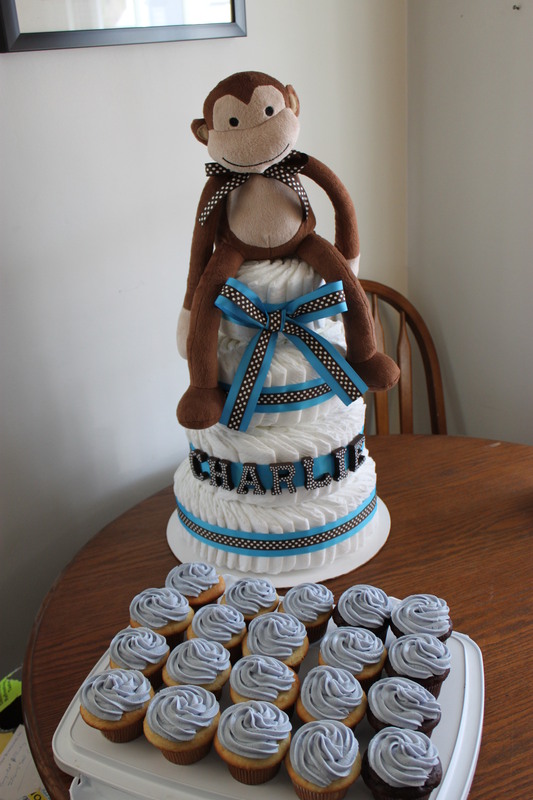 Most adorable diaper cake and yummy cupcakes!! Thanks so much for helping make my baby shower so special. What is the name of diapers you used? I can’t find all white diapers. Thanks. I used Pampers Swaddlers Sensitive – they aren’t completely white but you can wrap them in such a way that only the white is visible. Your cake looks fabulous! 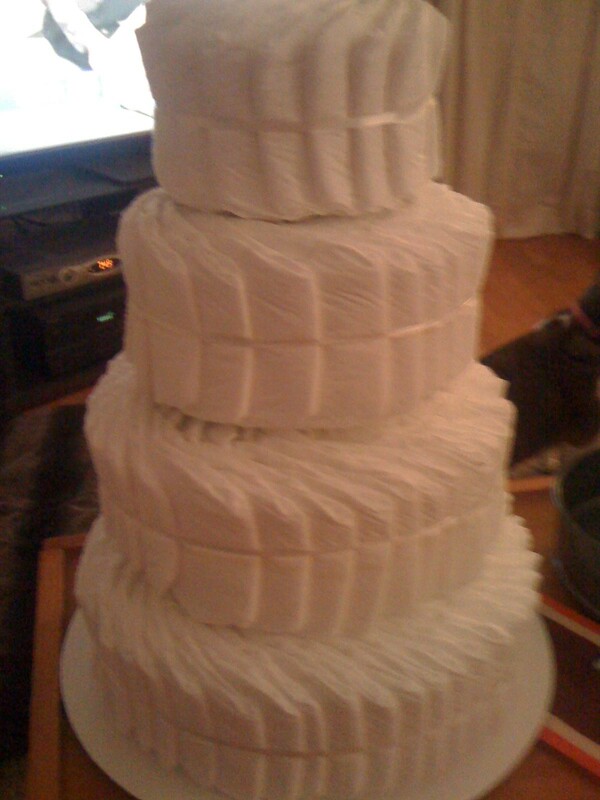 I was just wondering about how many diapers did you end up using to construct the whole cake? im sure you are in another state then AZ but where did you get the monkey?! we want one for our sister in laws shower 🙂 lol can u email me and let me know?! 🙂 shellwray08@aol.com. thanks so much! 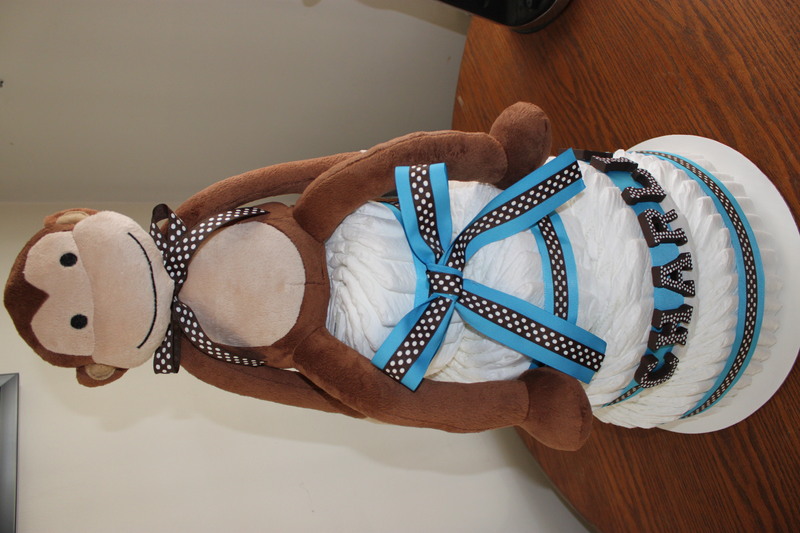 Cute diaper cake! We make our cakes the same way but we put a cardboard tube in the middle.